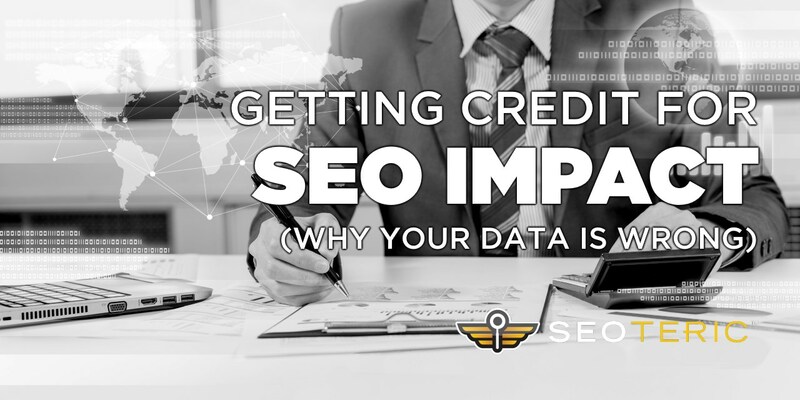 SEO practitioners have to be quite savvy at interpreting Analytics data and educating their customers on the real value that SEO brings. With cloudy data, we have to be able to connect known data points together to get a more accurate view of the big picture. As an SEO company, data is difficult. We used to get keyword data in Analytics but that went away with secure search. We used to get accurate keyword rank tracking but that has deteriorated with personalized and localized search. Most of our data points that we have are flawed in some way, and take some analysis to get to the real valuable metrics. There are a few places where data really can get off the rails. First, let’s look at keyword rankings. There are a lot of variables as to how and where a site may rank for specific keywords based on a user’s history, where they did their search and where the results are located. Rankings are a moving target. That’s why Webmaster Tools (Google Search Console) gives you the “average keyword position” as a ranking. This means that Google averages out your rankings across all of your impressions over time. Some users – based on location – may see you higher, some not at all. Some may have a preference for you based on history and some won’t. Some users may see you at position 12, where another may see you ranked in position 4, or even in the local map listings. Over all these impressions, Google gives you the average ranking position – which is our best look at how you are performing in search results. We also track keywords via a daily “snapshot” ranking to compare our findings with Google Search Console, and we usually find some big variances. Another data point that gives us headaches is where traffic comes from. Many website will see a breakdown similar to this chart. 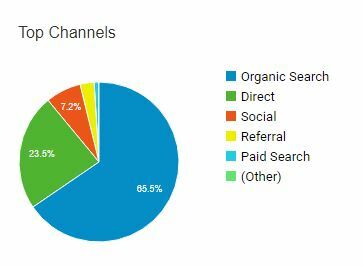 For this website, Google Analytics is telling us that around 65% of traffic is organic, 23% is direct (someone typed in the URL), 7% is from social media, and the rest is a small mix of referral and paid channels. But lets look a little closer. This breakdown looks pretty “accurate” at first glance, but once we assign numbers to the percentages, we have to dig into the data a little more. Google Analytics is telling us that over 14,000 people typed a URL directly into Google. The actual web pages and internal numbers won’t be shown for privacy’s sake – but here is what we see. The home page (the most common URL and probably the best known) accounted for 38% of the direct traffic. The other 62% of direct traffic landed on an internal page – and get this – almost NONE of the direct traffic resulted in a 404 error page. Of 188 page URLs that were supposedly typed directly into the address bar, 99.97% of the time a user typed the correct URL of an internal page into their browser. Only 0.03% of that traffic resulted in a 404 error page (meaning they got the URL wrong). And to point it out again, are we to believe that users know the exact URLs of 188 of our internal pages, and got it right 99.97% of the time? One possibility is that users could have pages saved in their history or in their bookmarks, but the “New VS Returning” visitors data doesn’t support that. Just in the “Direct” traffic alone, over 85% of the visits are “New Visits”. That suggest (if the data were actually accurate), 85% of these visits to internal landing pages are having to type in the URL into their address bar. That seems highly unlikely. The more likely scenario is that this traffic is actually organic traffic that has been incorrectly attributed to direct traffic. Take a quick look at this article over at Search Engine Journal on how and why this data is wrong. There are some good examples here of why this is occurring. The takeaway here is that a large portion of this “direct” traffic is most likely organic traffic. SEO efforts won’t get credit for this (or the conversions from it) from clients that look at the acquisition reports and attribute that to direct traffic. It puts our ROI at a disadvantage when SEO efforts and conversions get attributed to other traffic channels. 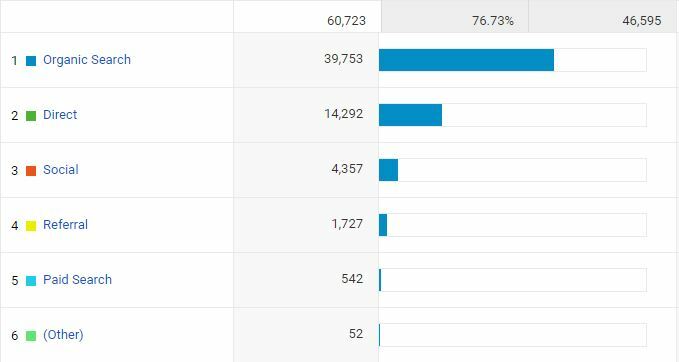 If we take Google Analytics word for it, we miss another 20% or so of actual organic traffic and the conversions that go along with it. The difficult part is that we can’t really know for sure exactly what users and conversions should be organic (or even a paid source like Adwords). Adwords allows us to apply additional tracking scripts to eliminate some of the guesswork, but only for converting traffic. Non-converting Adwords traffic could still potential end up under the direct traffic data. SEO practitioners have to be quite savvy at interpreting Analytics data and educating their customers on the real value that SEO brings. With cloudy data, we have to be able to connect known data points together to get a more accurate view of the big picture. This starts with Google Impressions all the way down to traffic and conversions. We have to keep an open dialog about the real impact of SEO, because even the best reports can sometimes prove to be inaccurate.